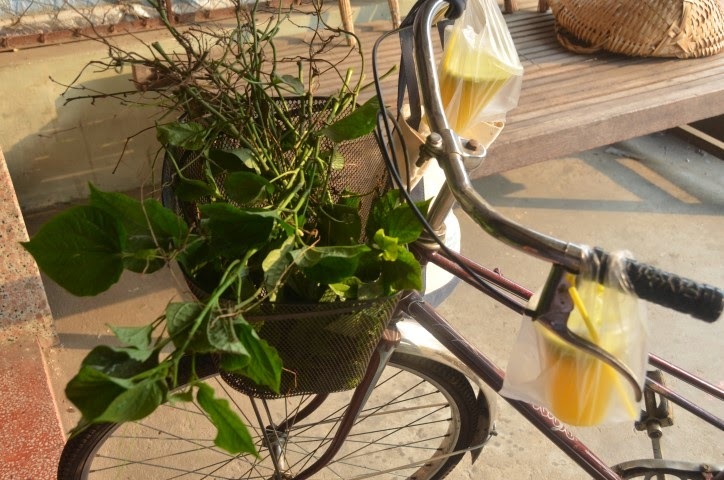 I went to harvest some special leaves called "lá lốt" in Vietnamese or wild betel leaves. Next to this patch of beautiful green leaves was a business with a sugar cane machine, the old fashioned type which is hand cranked. I have not seen this type since I left Vietnam in 1979. My father owned one prior to leaving and had used it to produce sugar cane drinks to sell. I remember him back in those days, he was a very strong man. He could easily turn the wheel with his own hands and the muscles in his arms. 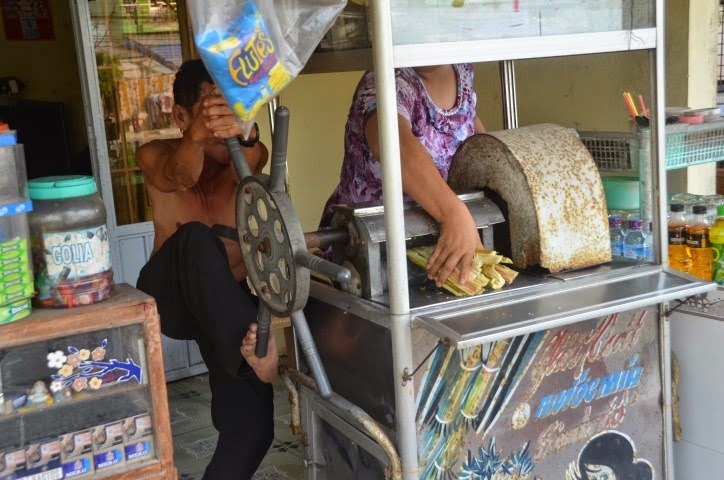 It was quite comical to see this man using his foot to help turn the wheel after the woman ran out of strength. I was caught off guard as I had never seen anyone using his leg to turn the wheel and had to control myself from laughing out loud. I guess the phrase about "a picture is worth a thousand words" is right on. Here is my photo of this man helping the woman turn the wheel! After all that work I decided to purchase 2 drinks without ice to take home. The woman put the drinks in 2 plastic containers and bags for me. The were the perfect size to put on my bicycle handles so I could ride the bike back to my grandmother's home (along Highway 1). Usually I do not like to drink the sugar cane juice straight since I find it too sweet. However,since the mid day (in An Trach, Vietnam) can be quite hot any ice in a drink melts quickly I have decided to pour the drink in large chunks of ice and slowly sipping it down while I work to clean my lá lốt harvest. From one container I was able to make a drink for myself and a mini one for Ah Ma (my grandmother). 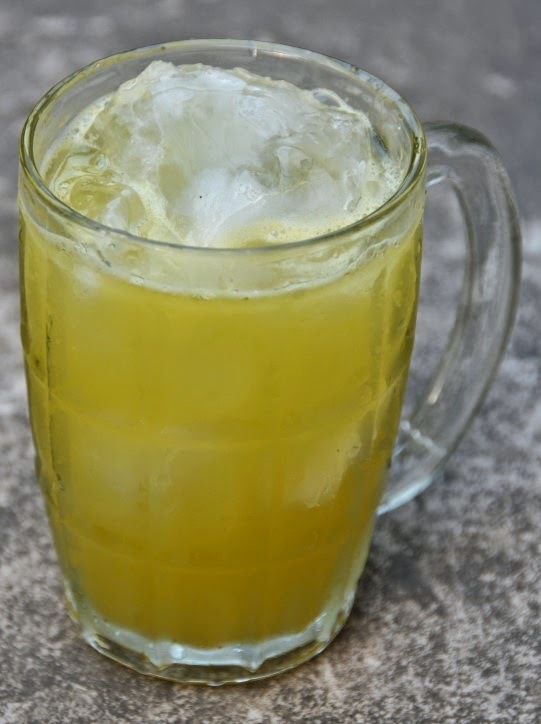 Pour the sugar cane juice over ice.